Wands are often lost, misplaced or discarded by the fair folk. Their size, and the natural materials with which they are made, provide excellent camouflage making them difficult to uncover. 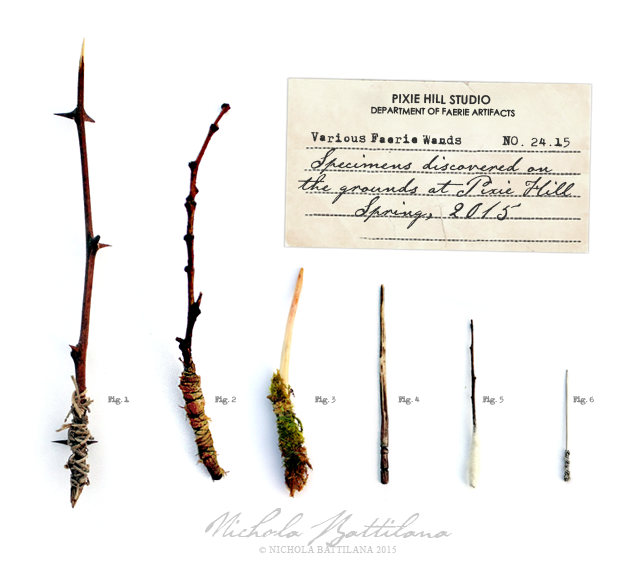 Today we will take a look at several varieties of faerie wands found at Pixie Hill. Fig.1 The 'Thorned Goblin Rod' provides all of the magical qualities of a wand and may also be used a weapon. Created from a young black locust branch, the thorns aren't just dangerous in appearance, they are poisonous. A scratch from the sharp points will cause pain that may last for several days. Fig. 3: This natural bone wand has a moss wrapped handle. Bone wands are far less common than wooden wands but not unheard of. Found in on the mossy ground beneath the big pines on the back lawn, it is likely that this once belonged to a forest dwelling faerie. Possibly dropped by a migratory Duwende. Fig.4: This very small wooden wand has a decorative carved handle. Although it's carving suggests elf or gnome origins, its size is more indicative of imp ownership. More exploration may be warranted to see if pygmy elves are inhabiting the grounds. Fig. 5: This small wand has a webbed grip indicating that it's owner was in good standing with spiders and other insects. Flower faeries are known to have an excellent relationship with arachnids, often working together to aid in the maintenance and care of gardens. Fig. 6: It is well known that most creatures with fae blood are repulsed by iron, steel, silver and other metals. There are a few examples to the contrary, dwarfs, ogres and some trolls, creatures who mine and forge are less affected by some metals. This delicate tiny wand seems unlikely to have been wielded by a troll so one must wonder.... to whom did it belong? This collection of wands and other faerie artifacts will be on display at the studio throughout the summer. Please check the events page for open house dates. PS: received the tiny books I ordered for my daughter as a Christmas gift and she will be sooooo excited to get these. I love them. Oh my! What an adventure finding these in your garden! What a great entry! Love the wands and the stories to go along with them. Very creative and wonderful mind. 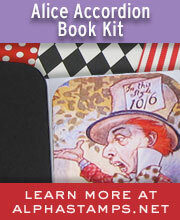 Your imagination station is really great!!! I was told that I should be a story teller of sorts, my imagination went wild (and still does) as a child! How about some faerie chairs?